The audience listens on at a recent Good Food Spotlight held at Brooklyn FoodWorks. 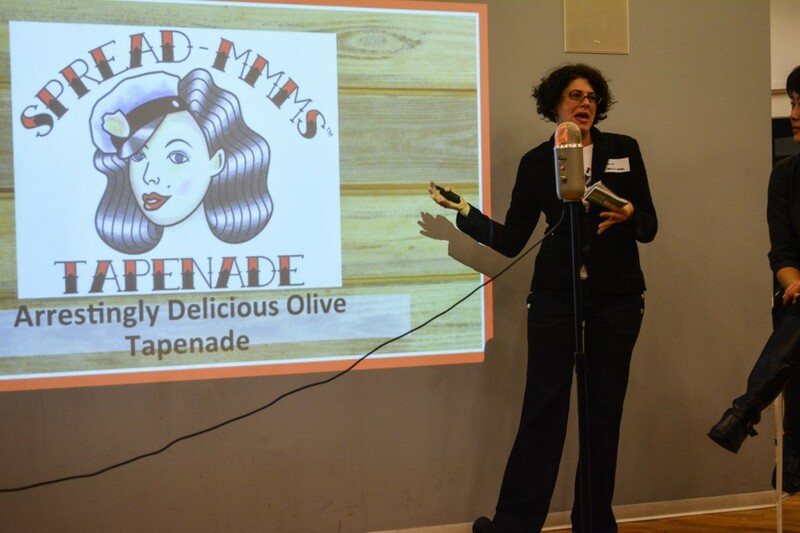 From Shark Tank to Foundermade—food entrepreneurs are getting more stage time to present their businesses to investors and audiences, but the Good Food Spotlight, co-produced by Foodstand and Slow Money NYC, has been a monthly staple for good food entrepreneurs. 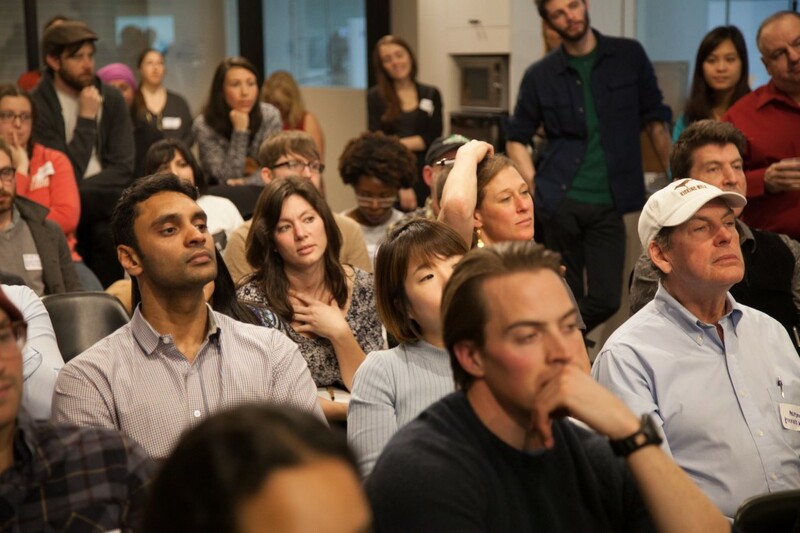 This month, the Good Food Spotlight, co-produced by Foodstand and Slow Money NYC, convened at Foodstand’s Headquarters on 5th Avenue to gather together for their monthly pitch fest. The crowd was larger than the last by at least two dozen people—a testament to the growing hunger and excitement around food entrepreneurship. Over 100 people—ranging from fellow food entrepreneurs and investors to food writers and straight up food-interested folk—buzzed about the smorgasbord of food, provided by Local Roots NYC, a pick-as-you-please CSA, and artisan cheese supplier, Murray’s Cheese. “This is the place to find exciting food products and services that are really startups…The real time tweets on the screen behind the presenter form a mosaic of Haiku market consumer intelligence and insights,” said Richard Gray, a seasoned food vet who has worked with the likes of Vital Choice Seafood, Balducci’s and Organic Avenue—and who was a first-time panelist and coach after attending an earlier Spotlight. “[T]here’s a lot of insights and professional feedback for the presenters,” he stated. Businesses of any size can apply to be a part of Spotlight—from those who are just starting out—like Bija Bhar, one of the presenters from the evening who creates organic, minimally-processed, portable, superfood products at newly-minted Brooklyn FoodWorks, to Kickstarter breakouts like Omar Rada’s Misen, which crowdsourced $1.1 million for a snazzy, affordable chef’s knife—to well-capitalized or well-on-the-path companies, like BonBite, which is a local, sustainable lunchbox and catering business that already services the likes of Etsy, Vogue and Casper. The judges in March’s Good Food Spotlight panel weigh in. 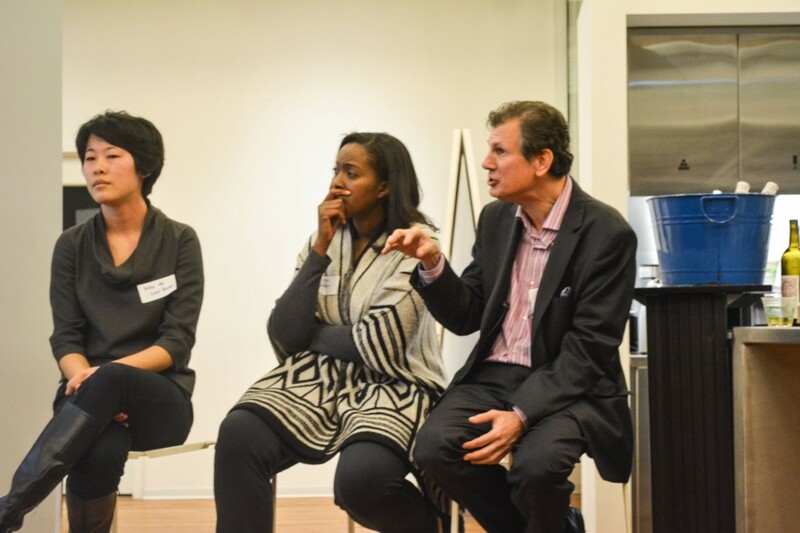 From L-R: Yusha Hu (Local Bushel), Devita Davidson (FoodLab Detroit) and food pioneer Richard Gray. Who thought olive tapenade could be so fun? Spread-mmms gets a laugh from the crowd. Ashly Yashchin, founder of Barley and Oats, was shocked to learn that 9 in 10 mothers are micronutrient deficient at conception, which was part of the reason why she started her food delivery service for new and expecting moms. “I’m looking at the numbers coming up [for the question] ‘If you were a mother at what phase would you order the most from our service?’,” Davidson said, referring to the crowdsourced feedback from the audience, “And it looks like the majority right now are coming in as postpartum recovery—the first 12 weeks post birth”, implying that Yashchin might want to focus her segment. There was also a suggestion by Gray to “think national” and consider having multiple kitchens, moving to flash frozen products, or modifying packaging to keep the freshness from 10 days to 2 weeks. 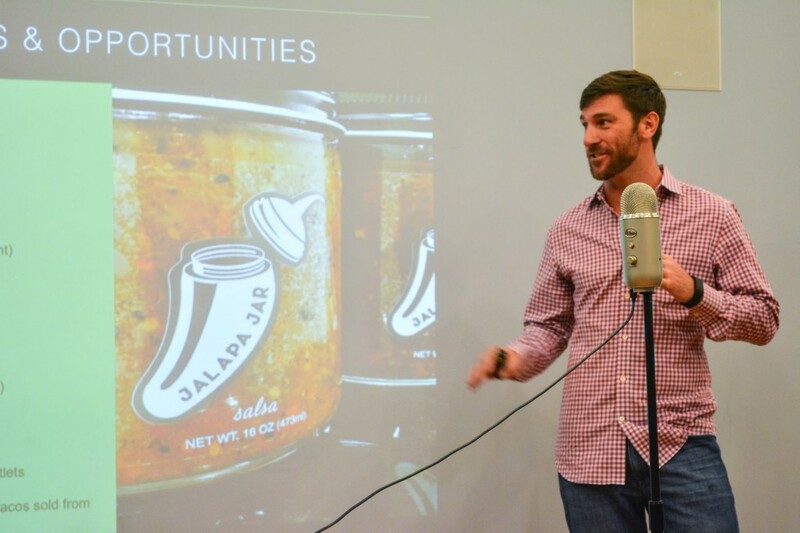 The Jalapa Jar founders realized they could own the breakfast salsa category after presenting at Spotlight. Join Foodstand and Slow Money NYC for our next Good FoodSpotlight event: Monday, May 16th in NYC! Want to see Spotlight in your hometown? Email us or reach out on our app and tell us why your city should be next!